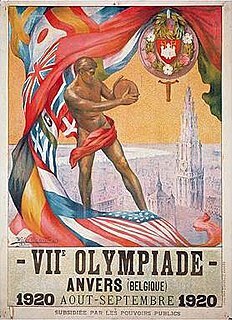 The 1920 Summer Olympics, officially known as the Games of the VII Olympiad, were an international multi-sport event in 1920 in Antwerp, Belgium. Ruhleben internment camp was a civilian detention camp in Germany during World War I. It was located in Ruhleben, a former Vorwerk manor 10 km (6.2 mi) to the west of Berlin, now split between the districts of Spandau and Charlottenburg-Wilmersdorf. The camp was originally a harness racing track laid out north of the Berlin-Hamburg Railway line in 1908. The Harry Edward Papers, including correspondence, photographs, and other personal papers, are at the Amistad Research Center in New Orleans. For a more complete description, see the finding aid for the collection. Charles William Paddock was an American athlete and two time Olympic champion. William Reuben "Willie" Applegarth was a British track and field athlete, and winner of a gold medal in the 4 × 100 metres relay at the 1912 Summer Olympics. Loren C. Murchison was an American athlete, double gold medal winner in 4×100 m relay at the Olympic Games. Charles Edward "Charley" Borah was an American athlete, winner of gold medal in 4 × 100 m relay at the 1928 Summer Olympics. Alan Boone Helffrich was an American athlete, winner of gold medal in 4 × 400 m relay at the 1924 Summer Olympics. The Hon. Herbert Henry "Herb" McKenley OM was a Jamaican sprint runner. He competed at the 1948 and 1952 Olympics in six events in total, and won one gold and three silver medals. The Battle of Messines(7–14 June 1917) was conducted by the British Second Army, on the Western Front near the village of Messines in West Flanders, Belgium, during the First World War. The Nivelle Offensive in April and May had failed to achieve its more ambitious aims, had led to the demoralisation of French troops and dislocated the Anglo-French strategy for 1917. The offensive at Messines forced the Germans to move reserves to Flanders from the Arras and Aisne fronts, which relieved pressure on the French. The tactical objective of the attack at Messines was to capture the German defences on the ridge, which ran from Ploegsteert (Plugstreet) Wood in the south, through Messines and Wytschaete to Mt. Sorrel, to deprive the German 4th Army of the high ground south of Ypres. The ridge gave commanding views the British defences and back areas further north, from which the British intended to conduct the Northern Operation, an advance to Passchendaele Ridge and then capture the Belgian coast up to the Dutch frontier. Harry Maitland Hay was an Australian freestyle swimmer of the 1920s who won a silver medal in the 4 × 200 metre freestyle relay at the 1920 Summer Olympics in Antwerp. He later enjoyed success as a swimming coach, guiding Boy Charlton to Olympic gold. Sir Francis "Frank" Joseph Edmund Beaurepaire was an Australian distance freestyle swimmer from the 1900s to the 1920s, who won three silver and three bronze medals, from the 1908 Summer Olympics in London to the 1924 Summer Olympics in Paris, setting 15 world records. Robert George Windle is an Australian freestyle swimmer of the 1960s, who won four Olympic medals, including an individual gold medal. Windle won the 1500 m freestyle and took bronze in the 4 × 100 m freestyle relay at the 1964 Summer Olympics in Tokyo, and silver and bronze in the 4 × 200 m and 4 × 100 m freestyle relays respectively at the 1968 Summer Olympics. Known for his versatility, he is the only male swimmer to represent Australia at the Olympics in all freestyle distances from 100 m to 1500 m. During his career, Windle set six world records and won six Commonwealth Games gold medals. He won 19 Australian championships in all distances from 220 yd to 1650 yd. Kevin O'Halloran was an Australian freestyle swimmer of the 1950s who won a gold medal in the 4×200-metre freestyle relay at the 1956 Summer Olympics in Melbourne. John Konrads is an Australian former freestyle swimmer of the 1950s and 1960s, who won the 1500 m freestyle at the 1960 Summer Olympics in Rome. In his career, he set 26 individual world records, and after his swimming career ended, was the Australasian director of L'Oréal, as well as campaigning for the Sydney Olympics bid. Along with his sister Ilsa Konrads, who also set multiple world records, they were known as the Konrad Kids. Cecil Patrick Healy was an Australian freestyle swimmer of the 1900s and 1910s, who won silver in the 100 m freestyle at the 1912 Summer Olympics in Stockholm. He also won gold in the 4 × 200 m freestyle relay. He was killed in the First World War at the Somme during an attack on a German trench. Healy was the second swimmer behind Frederick Lane to represent Australia in Swimming and has been allocated the number "2" by Swimming Australia on a list of all Australians who have represented Australia at an Open International Level. Henricus Adrianus "Harry" Broos was a Dutch sprinter, who competed in the 100 m, 200 m, 400 m, 4 × 100 m and 4 × 400 m events at the 1924 and 1928 Summer Olympics. He won a bronze medal in the 4 × 100 m relay in 1924 and failed to reach the finals on all other occasions. Wilfred Paulin Nichol was an English sprinter who competed at the 1924 Summer Olympics. He won a silver medal in the 4×100 m relay, together with Harold Abrahams, Walter Rangeley and Lancelot Royle, but failed to reach the finals of the individual 100 m and 200 m events. Nichol placed second-third in the 100 yd and 220 yd events at the Amateur Athletic Association of England (AAA) championships of 1923–24. In the 1923 100 yd final he was second to Eric Liddell, who set a new British record at 9.7 seconds. In 1926 Nichol became the first Honorary Secretary on the formation of Nottinghamshire AAA. Guy Montagu Butler was a British sprinter, winner of the gold medal in the 4 × 400 m relay at the 1920 Summer Olympics. With four Olympic medals Guy Butler shares the British record for the number of medals in athletics with Sebastian Coe and Mo Farah. Fritz Albert Erich "Ete" Rademacher was a German breaststroke swimmer and water polo goalkeeper who competed at the 1928 and 1932 Olympics. In 1928 he was a member of the German team that won the gold medal, he also won a silver medal in the 200 m breaststroke. Four years later he won another silver medal with the German water polo team. His younger brother Joachim was his teammate in both water polo tournaments. Philippa Mary "Pip" Gould, later Philippa Gower, is a former backstroke swimmer from New Zealand. She competed at the 1956 Summer Olympics placing sixth in her heat of the 100 m backstroke. In January 1957, she broke the 200 m and 220 yd backstroke world records, and in March 1958, she broke the 100 m and 110 yd backstroke records. At the 1958 British Empire and Commonwealth Games she won the bronze medal in the 110 yd backstroke. In 1995 Gould was inducted into the New Zealand Sports Hall of Fame. The Battle of the Menin Road Ridge, sometimes called "Battle of the Menin Road", was the third British general attack of the Third Battle of Ypres in the First World War. The battle took place from 20–25 September 1917, in the Ypres Salient in Belgium on the Western Front. During the pause in British and French general attacks between late August and 20 September, the British changed some infantry tactics, adopting the leap-frog method of advance, where waves of infantry stopped once they reached their objective and consolidated the ground, while other waves passed through the objective to attack the next one and the earlier waves became the tactical reserve. General adoption of the method was made possible when more artillery was brought into the salient, by increasing the number of aircraft involved in close air support and by specialising the tasks of air defence, contact-patrol, counter-attack patrol, artillery observation and ground-attack. The Leach trench catapult was a bomb-throwing catapult used by the British Army on the Western Front during World War I. It was designed to throw a 2 lb (0.91 kg) projectile in a high trajectory into enemy trenches. Although called a catapult, it was effectively a combination crossbow and slingshot. It was invented by Claude Pemberton Leach as an answer to the German Wurfmaschine, a spring-powered device for propelling a hand grenade about 200 m (220 yd). Wikimedia Commons has media related to Harry Edward .